It's finally getting colder, even in Florida. That means it's time to break out the warm cozy sweaters, the scarves, and warm drinks. While coffee and hot cocoa are on the top of most lists for warm and comforting drinks, there are a few others that make this season feel more festive. Wassail and Mulled Wine are just two traditional and warm drinks that can make the holidays more cheerful. Plus they are also super healthy. Wassail is a traditional drink that dates all the way back to the Middle Ages in Europe. 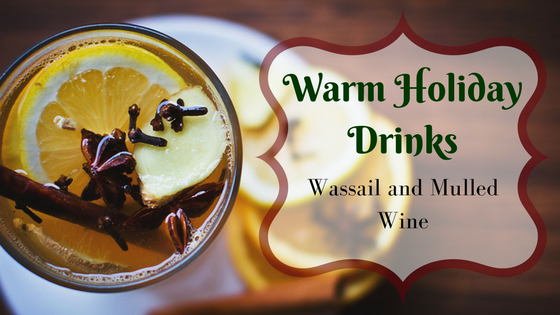 Wassail is traditionally made with hard cider, seasonal spices, and a variety of seasonal fruits. There are so many recipes and variations today that you can make your Wassail unique to your family without much effort. Apple Cider is one of the traditional ingredients and I can't imagine a Wassail recipe without it. You can use hard apple cider or non-alcoholic apple cider. Orange Juice provides a super amount of vitamins that help support your immune system and fight colds and the flu. Pomegranate Juice is a more modern addition that you can use in place of orange juice, or with it (use half orange juice and half pomegranate juice). Pomegranate juice is high in antioxidants and vitamins which help your body fight off infections and help boost your immune system and endurance. Cranberry Juice is a more traditional addition and you can use it instead of the orange juice, or you can use it with the orange juice (use half orange juice and half cranberry juice). Cranberry juice is full of vitamins and minerals that help provide support for your immune system. It also helps to fight off a number of infections. Cinnamon is one of the ingredients you will find in all Wassail recipes. It provides a natural sweetness without adding sugar, and is an excellent medicinal herb. You can read more about the benefits of cinnamon here. Clove is another ingredient you will find in all Wassail recipes. These little spices are packed full of medicinal benefits that include pain relief, improving digestion, reducing inflammation, relieving the symptoms of upper respiratory infections, and much more. Nutmeg is an herb you will usually find accompanying both cinnamon and clove. It is a mild sedative, helping to relax and making sleep more peaceful. Star Anise adds a slight licorice flavor to the blend, and it looks super impressive. Medicinally it's used to help sooth sore throats, treat cold and flu, as well as relieving quite a few digestive issues. Juniper Berries are one of my favorite ingredients to add to my Wassail because they add a timeless flavor. Juniper berries are also super healthy. They help fight bacterial infections, they help you to get the most out of your sleep, they improve digestion, and they are good for your heart. Ginger adds a nice punch to your Wassail. It's also one of my favorite medicinal herbs for this time of year. You can read more about ginger here. Cardamom is the herb that gives Chai Tea it's distinctive flavor. It's also a great digestive herb and helps support the liver. Pine Needles might seem like a strange addition, but they add a nice, citrus-like flavor. They are also super loaded with vitamins. Read more about the benefits of pine here. Fresh Fruit is often added to improve the flavor and make the Wassail look amazing. The most commonly added fruits are citrus and apples. You can also find cranberries, pomegranates, and just about any seasonal fruit. Health Promoting Herbs make great additions to any recipe. Though the traditional herbs I have already listed are also super healthy, feel free to try your favorite herbs. I've seen Wassail recipes that include rose hips, hibiscus, hawthorne berries, elder berries, chamomile, lemon balm, lemon grass, passiflora, raspberry leaves, and so much more. Liquor is something we all know the dangers of, but it's also full of health benefits. Plus, it makes any party awesome. The traditional alcohol to use for Wassail is brandy, however you can also try whiskey, rum, or just about any liquor you want. Two of my favorites to add are honey flavored whiskey or spiced rum. Combine all ingredients in a large stock pot, or crock pot, and bring to a simmer (in the crock pot, heat on low) stirring occasionally. Turn down heat, cover, and warm for at least 1 hour. You can also remove from the heat and store to warm up for a future use. Another traditional drink served during the winter months. Mulled Wine is typically red wine sweetened and spiced, but modern recipes have made it much more than that by adding in fresh seasonal fruit and alcohol. I know this seems like a warm version of sangria, but it's a great addition to any holiday party. Not to mention the health benefits. Cinnamon is one of the ingredients you will find in all mulling spice recipes. It provides a natural sweetness without adding sugar, and is an excellent medicinal herb. You can read more about the benefits of cinnamon here. Clove is another ingredient you will find in all mulling spice recipes. These little spices are packed full of medicinal benefits that include pain relief, improving digestion, reducing inflammation, relieving the symptoms of upper respiratory infections, and much more. Allspice is an impressive herb from any standpoint. It's name comes from the fact that it has flavor notes from all the major spices such as cinnamon, clove, and nutmeg. It's also great for your health, aiding in digestion and helping to improve immune function. Black Peppercorns add a bit of heat to your Mulled Wine, but they also help improve your digestion. Ginger adds a nice punch to your Mulled Wine. It's also one of my favorite medicinal herbs for this time of year. You can read more about ginger here. Honey is a great way to sweeten your Mulled Wine without resorting to sugar. It's also full of health benefits and can help fight off infections. Fresh Fruit is often added to improve the flavor and make the Mulled Wine look amazing. The most commonly added fruits are citrus and apples. You can also find cranberries, pomegranates, and just about any seasonal fruit. Health Promoting Herbs make great additions to any recipe. Though the traditional herbs I have already listed are also super healthy, feel free to try your favorite herbs. Some herbs to try include rose hips, hibiscus, hawthorne berries, elder berries, chamomile, lemon balm, lemon grass, passiflora, raspberry leaves, juniper berries, pine needles, and so much more. Liquor is something we all know the dangers of, but it's also full of health benefits. Plus, it makes any party awesome. The traditional alcohol to use for Mulled Wine is brandy, however you can also try whiskey, rum, or just about any liquor you want. Two of my favorites to add are spiced rum or apple flavored whiskey. Combine all ingredients in a large stock pot, or crock pot, and bring to a simmer (in the crock pot, heat on low). Turn down heat, cover, and warm for at least 30 minutes. You can also remove from the heat and store to warm up for a future use. I hope you have a wonderful Holiday Season and enjoy these great recipes! If you have any questions or comments, please leave them below. Feel free to share your experiences with us as well!